A reproduction of a hanging parasol was recently installed in the piazza at Castle Tucker in Wiscasset, Maine. Mollie Tucker and her daughter, Jennie, were facing difficult financial circumstances when they returned from a trip to find their lovely piazza had been badly damaged by a water leak. Not having the money to repair the stenciled walls and ceiling, Mollie went to local businesses to find cardboard, sandpaper, and other materials to cover the damage. Jennie added inexpensive Asian-style fans, lanterns, and a hanging parasol as decorations. The large parasol hung from the ceiling of the piazza until it was removed by Historic New England’s collection services staff for assessment. 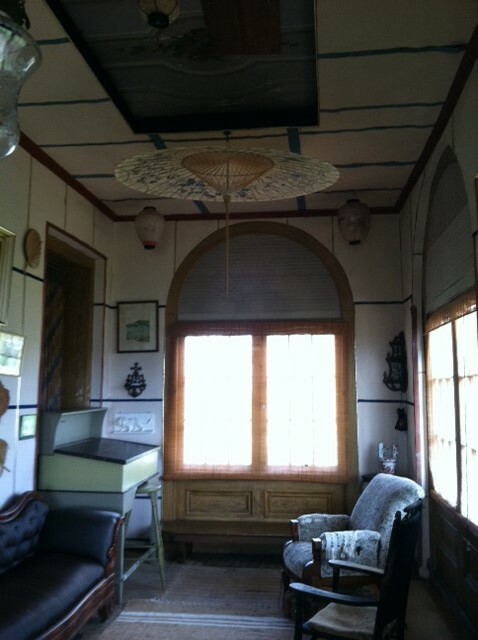 The parasol was badly light-damaged from hanging in the sunny room for more than one hundred years. Historic New England staff decided to have an exact replica made to be rehung in the piazza. While the reproduction was being fabricated to precise specifications in Beijing, China, the original was carefully put into collections storage to prevent any further damage or loss. In May of 2013, the collection services team was able to hang the reproduction at Castle Tucker. Now visitors can see what the parasol would have looked like when it was hung by Mollie and Jennie so many years ago. Castle Tucker is open for tours June 1 through October 15, Wednesday through Sunday, 11:00 a.m. to 5:00 p.m.